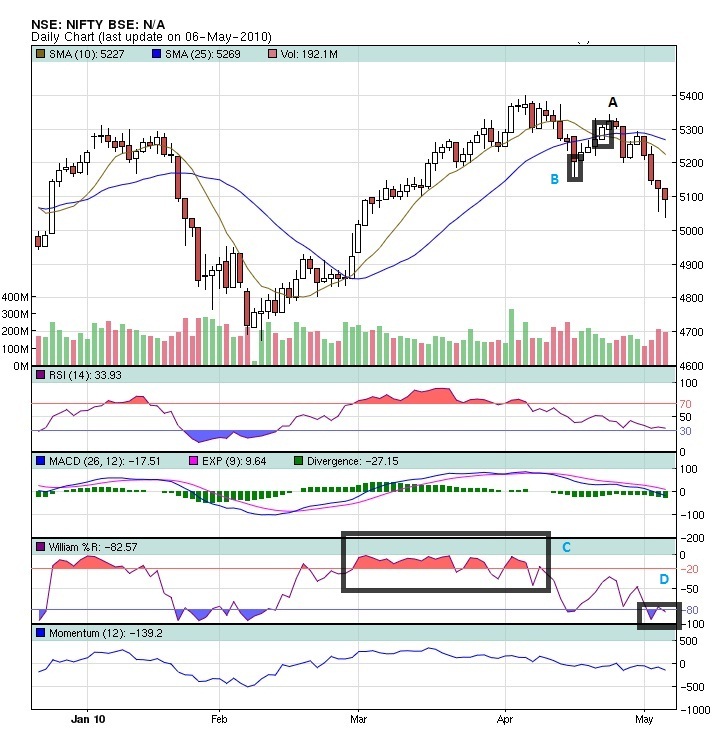 I was bearish on NIFTY for a long time cause of variety of reasons like high P/E Ratio, High Interest Rates in near future,China Factor,Greece Problem etc Most of the factors are negative to Nifty and i am still wondering why all of sudden my view on market got changed after the last expiry and overnight i went from highly bearish to moderately bullish side. I Guess it was a big mistake of changing my stance, though i was bit bearish and bought 5100 put and sold 4800 put and was kind of gamble cause am selling a put (Unlimited Risk). Then comes the Black Swan in form of Greece and made the market to drag down. And i was bit lucky to have 5100 put and made good return in it and squared of it expecting the market will not go down much.But am wrong the market is dragging down daily and my position of 4900 sell is making losses and i will be bankrupt if it breaches 4900 before that i have to make a decision. In the Fourth Rectangle is Williams indicator and highlighted region is marked in Black box with letter C , This was the time at which i was highly bearish cause the indicator touched 80+ for many days..that indicates its highly overbought and anytime it can sell off...its not that easy to predict sell off at least for me and only from historical data we can see it ..It was in overbought state for one month and for whole month of march to mid april i was bearish ,during that time market went up and i was made wrong. I am a whole lot curious as to what you meant by "bought 5100 put and sold 4800 put ..." .. do you trade these things on your personal account or is it for the firm you are working ??? Hey LP...where do u do this technical analysis? U got an account with bloomberg or Reuters?? I guess u r aware about the 1000 point intraday fall in DJIA on thursday?? Anyway, it is coz of a trading error, but still the close was 350 points below. And there is suddenly a bearish scenario in US unemployment data, after a few weeks of optimistic results. If u r looking at the world markets, these give fresh bearishness from the last week. @ Suziki ..Thanks a lot for taking time and reading my blog....Dude am trading from my account dude..just learning for now..